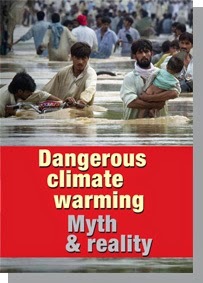 Few would disagree that the world should avoid "dangerous" (or unsafe) climate warming, but what does that term mean? What does climate safety mean? Is climate change already dangerous? Are greenhouse gas levels already too high? This report surveys some recent developments in climate science knowledge as a way of discerning the gaps between myth and reality in climate policy-making. Amongst advocates for substantial action on climate warming, there is a presumption of agreement on the core climate science knowledge that underlies policy-making, even though differences exist in campaign strategy. But the boundaries between science and politics have become blurred in framing both the problem and the solutions. Amongst advocates, advisors and policy-makers there are very different levels of understandings of the core climate science knowledge, how it is changing, what constitutes "danger," what needs to be done, and at what pace. On the science side, the challenge is of a fast-developing discipline in a rapidly changing physical world. There is a concerted and unwarranted global attack on climate scientists and, in Australia, intimidation and fear of job loss generated by the Abbott government’s hostility to science and cuts in climate research funding. As well, there are always uncertainties and unknowns in science, and difficulties in communicating complex understandings in a non-technical manner. Together these factors can produce over-cautiousness in public presentation and scientific reticence. In his 2011 climate science update for the Australian Government, Prof. Ross Garnaut gave some "reflections on scholarly reticence," questioned whether climate research had a conservative "systematic bias," pointed to "unfortunate delays between discovery and influence in the policy discussion," and asked "whether the reason why most of the new knowledge confirms the established science or changes it for the worse is scholarly reticence." Garnaut pointed to a pattern across diverse intellectual fields of research being "not too far away from the mainstream," but says in the climate field that this "has been associated with understatement of the risks." With masterly restraint, he concluded that we should be "alert to the possibility that the reputable science in future will suggest that it is in Australians’ and humanity’s interests to take much stronger and much more urgent action on climate change than might seem warranted from today’s peer-reviewed published literature. We have to be ready to adjust expectations and policy in response to changes in the wisdom from the mainstream science" (Garnaut, 2011). On the politics side, often insufficient attention is paid to the breadth and depth of published research, and there is a tendency to prioritise perceived political relevance over uncomfortable scientific evidence. Most climate advocacy organisations allocate few resources to critically interrogating the climate research as part of strategy and policy development, and generally fall into a middle-of-the-road advocacy consensus which downplays the warnings from the more forthright scientists whose expert elicitations – on such topics as the stability of ice sheets and sea ice to future sea-level rises – have generally proven more robust than those of their more reticent colleagues. A desire amongst advocacy organisations to stick together and present a common mainstream view is understandable, but Garnaut has pointed out the scientific danger, and his observation is just as powerful for climate politics. There is little point in constructing campaign strategies discordant with a fast-changing reality. Climate change is not yet dangerous, and two degrees of warming (2 °C) is the appropriate focus for policy-making, because 2 °C impacts are manageable and big tipping points are unlikely before 2 °C. We should plan to mitigate (reduce emissions) for 2 °C, but we may fail so we should also plan to adapt to 4 °C (which is the likely "business-as-usual" outcome by 2100 if high rates of emission continue). We have a substantial carbon budget left for 2 °C, because long-term feedbacks are not materially relevant, and high risks of failure can be accepted because 2 °C is a “target” (which can be exceeded) rather than a “cap” (an upper boundary not to be exceeded). Hence, there is time for an orderly, non-disruptive reduction in emissions within the current political and economic paradigm. Much of the recent international policy discourse has focused on "what percentage reductions by when and by whom" in emissions would stop warming passing 2 °C. In Australia, is it 5% by 2020, or 19%, or a lot more? Till 2030 or 2050? An observer of this discourse would not think that 2 °C is other than a reasonable target and that we have plenty of carbon emissions left for a few decades more. They would certainly not understand that such propositions are dangerous myths. Here's why. In 2008, John Holdren, who was then senior advisor to President Barack Obama on science and technology issues, told the Eighth Annual John H. Chafee Memorial Lecture on Science and the Environment: "… the (climate) disruption and its impacts are now growing much more rapidly than almost anybody expected even a few years ago. The result of that, in my view, is that the world is already experiencing dangerous anthropogenic interference in the climate system ” (emphasis added) (Holdren, 2008). 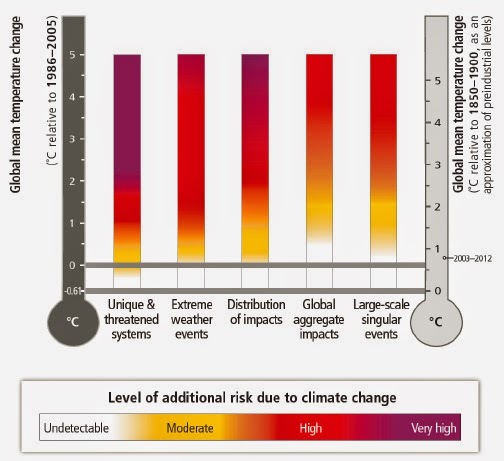 “Dangerous” climate changed is broadly characterised by the Intergovernmental Panel on Climate Change (IPCC), in the “burning embers” diagram, as including five “reasons for concern”: risk to unique and threatened systems, risk of extreme weather events, distribution of impacts, aggregate (total economic and ecological) impacts, and risk of large-scale discontinuities (that is, abrupt transitions or “tipping points”) (see Figure 1). The loss of the Amundsen Sea West Antarctic glaciers, and 1–4 metres of sea level rise (Rignot, Mouginot et al., 2014; Joughin, Smith et al., 2014). Dr Malte Meinshausen (advisor to the German government and one of the architects of the IPCC's Representative Concentration Pathways) calls the evidence published this year of “unstoppable” (Rignot, 2014) deglaciation in West Antarctica “a game changer” and a “tipping point that none of us thought would pass so quickly,” noting now we are “committed already to a change in coastlines that is unprecedented for us humans” (Breakthrough, 2014). Many extreme weather events that have been made worse by climate change and variations of the Jet Stream — including Superstorm Sandy, Typhoon Haiyan and extraordinary heat waves in France (2003) and Russia (2010) and associated death tolls of many thousands — are also evidence that climate change is already dangerous. “During mid-Miocene climatic optimum [16–14 million years ago] CO2 levels were similar to today, but temperatures were ~3–6C warmer and sea levels 25–40 metres higher than at present… When CO2 levels were last similar to modern values (greater than 350–400 ppmv), there was little glacial ice on land, or sea ice in the Arctic, and a marine-based ice mass on Antarctica was not viable… Lower levels were necessary for the growth of large ice mass on West Antarctica (~ 250–300 ppmv) and Greenland (~ 220–260 ppmv)" (Tripati, Roberts et al., 2009). “We estimate sea level for the Middle Pliocene epoch [3.0–3.5 million years ago] – a period with near-modern CO2 levels – at 25 ± 5 metres above present, which is validated by independent sea-level data” (Rohling, Grant et al., 2009). Likewise, “during the middle-Pliocene … we find sea level fluctuations of 20–40 metres associated with global temperature variations between today’s temperature and +3 °C” (Hansen, Sato et al., 2013). Figure 1. The ‘burning embers’ diagram from the IPCC’s Fifth Assessment Report illustrates risks for five key areas of concern. Note that for “Large-scale singular events” (right-hand column) the risk at the current level of warming is assessed as “undetectable,” whereas there is now clear evidence that dangerous tipping points have been already passed for significant elements of the climate system. The evidence above indicates that dangerous tipping points have already been passed at the current level of climate warming of 0.8 °C, so 2 °C of warming is clearly not an appropriate focus for policy making. 2 °C is a very unsafe target in any framing of risk. It is more appropriately considered as the boundary between dangerous and very dangerous climate change (Anderson & Bows, 2010). In Australia, 2 °C would likely mean, amongst many impacts, the loss of the Great Barrier Reef, the salination of Kakadu, and the loss of the north Queensland tropical rainforests. This is consistent with a framework of “planetary boundaries” published in 2009, which “define the safe operating space for humanity with respect to the Earth system and are associated with the planet’s biophysical subsystems or processes” (Rockstrom, Steffen et al., 2009). It proposes a boundary of less than 350 ppm CO2e, compared to the current level of more than 470 ppm CO2e. 1 °C of warming over the pre-industrial baseline — which we are now approaching — is hotter than the Holocene maximum (the period of human civilisation up to 1900) (Marcott, Shakun et al., 2013; Hansen, Kharecha et al., 2013) (see Figure 2). For 2 °C of warming, the sea-level rise will likely eventually be measured in the tens of metres (Rohling, Grant et al., 2009). Hansen and Sato (2012), using paleoclimate data rather than models of recent and expected climate change, warn that “goals of limiting human-made warming to 2 °C and CO2 to 450 ppm are prescriptions for disaster” because significant tipping points – where significant elements of the climate system move from one discrete state to another – will be crossed. As detailed in the next section, numerous tipping points are likely well before 2 °C. As well, the IPCC considers that the risks to unique and threatened systems, and of extreme weather events, is high at 2 °C of warming (see Figure 1).